All Amish literature is apocalyptic literature. On the face of it, that might seem like an odd thing to say. We like reading both, if you look at the books out there. But we don't see them as related. 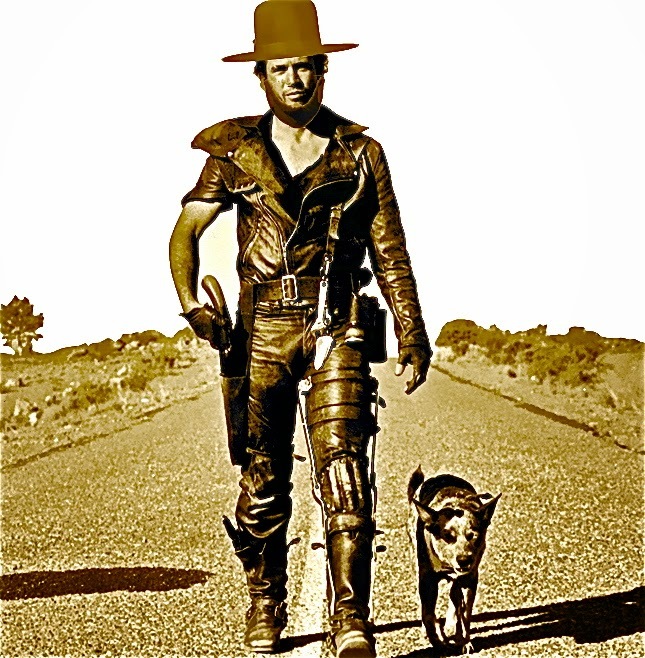 When you think of apocalyptic stories, they tend to involve craggy, laconic men in tattered leather garb wandering through a blasted wasteland. There are zombies. And asteroids. And pandemic plagues. Or some combination thereof. When we think of Amish fiction, we do not visualize these things. We see pastel paperback covers, involving bonnets and beards and buggies. Inside those covers, we expect chaste romance, and the gentle human drama of a slower and less frenetic life. Amish fiction, if it had a smell, would smell nothing like the sweat, blood, and hormones of other adult fiction. It's got the fragrance of warm rhubarb pie and the rich dirt of your garden under your nails. It's why I'd get a bit of a snicker whenever I'd tell friends and church folk what I was writing. "What kind of book is it," they'd ask. "Postapocalyptic Amish fiction," I'd say, because it was true. And there'd come that smile. Oh, you crazy pastor. But if you have a sense of who the Amish are, and why they are, and what the word "apocalypse" means, it becomes a little clearer. The Amish are primordial Baptists, the Protestant equivalent of one of those strange prehistoric fish they'll find now and again in deep ocean waters. They get their name from Jakob Ammann, a semi-literate seventeenth century Swiss farmer. From the few records we have of his life, he appears to have been a fairly hard-nosed human being, who felt that strict adherence to the teachings of the Bible was the only way to live. Ammann was a big advocate of shunning--meaning not associating with folks who did not do exactly and to the letter what the Bible told them to do. He favored long, uncut beards, and vigorously opposed any significant engagement with the values of the world. His followers separated themselves not just from non-Christians, but from other early Baptists and Mennonites. Those who followed him stuck around in Switzerland for a while, but when religious violence and oppression became too overbearing in the late 18th century, they began immigrating to the United States. Since arriving in the United States back in the 1860s, the lives of the Old Order Amish have remained remarkably similar. In most communities, they speak Deitsch, which isn't "Dutch," but a variant of old Swiss German. Because they've chosen to reject the world and live in simple community, they do not engage with modern technology. The fabric of daily life for the Amish looks much the same way it did back in the eighteenth and nineteenth century. It's pretty basic, involving family farming and older, manual crafts. If you spend any time reading Amish fiction, this is the buggies, bonnets, and beards part. It all feels very much like the world of the Little House books, only peculiarly transposed into our modern era. No cars, no lights, no motorboats, not a single luxury, as they sang on Gilligans Island. This is how they have chosen to live, simple, self-sufficient, and independent of our increasingly interconnected and industrial society. There's variety in Amish communities, of course. They are as varied among themselves as individual congregations are varied, though we see them all through the same lens. Communities vary in what they view as their Ordnung, the rule that governs their day to day lives. But all view themselves as separate from us out here in the mess and rush of the modern world, we who they refer to collectively as the English. Oh sure, we may be Scottish or French or Guatemalan. But to their eyes, we are all English. Amish life is governed by some very different principles. There is hochmut, which are the things to be avoided. Hochmut describes the fruits of human pride, arrogance, and selfishness, the sort of thing that populates pretty much every reality television show. There is demut, which is the opposite. It describes those things that arise from humility and humbleness. And there's gelassenheit, which represents a sort of nonviolent spiritual detachment. You do not grasp, or seek your own advancement. You maintain a gentle contentment with whatever lot you are given. The Amish see these principles as living into the way of life taught by Jesus, in a way that does not cloud or compromise it with any of the distractions of our cluttered, greedy world. Here is where our stories about the Amish and our stories of apocalypse come together. The word apocalypse does not mean destruction or some final battle. ἀποκάλυψις means, in the Greek from which we received that word, an "unveiling." A "revealing." A "making clear," which someone should have mentioned to John of Patmos when he was writing that crazy book of his. Apocalyptic literature, as a literary (and biblical) genre, is about the stripping away of all of the fluff and pretense and getting down to what matters. In a very real way, that is what draws we English to the stories of the Amish. We sense, somehow, that most of the madness of our lives is unnecessary. So much of our energy is poured into things that seem irrelevant, or meaningless. We tell ourselves stories of what it would be like if we had to get back to basics, if all that [stuff] was torn away and we had to survive onslaughts of the shambling dead, or rebuild after that cataclysmic asteroid strike. Or that massive solar storm. But the Amish? That is just how they are. They never put on the veil of modernity. They do not fill their lives as we do, with meetings and media, activities and anxieties, distraction and debt. As so we also tell ourselves stories about the Amish, in which all of the things that crowd our days have been pulled away. And those stories are, in their own way, gently pastel apocalypses.